But no, the phone isn’t broken. I actually did it on purpose. It was supposed to be a one week experiment, and now it’s been months, and I don’t want to go back. I’ll tell you why I sabotaged my iPhone’s functionality, stripping it down to what’s basically a really fancy feature phone, and I’ll also tell you how to do it yourself, in case you get curious along the way. It’s pretty easy to try, and in my opinion, it feels really great. I promise not to get all preachy. Well, promise is a big word. I’ll try, okay? Really this is more about me and the glitches in my own brain. I think most people can handle it. But for whatever reason, I don’t seem to have the self-control for a full-fledged modern smartphone. iPhones and Androids are wonderful. They’re amazing. It’s infinite information in the palm of your hand! But here’s the thing: I don’t have what you’d call the world’s greatest attention span. It’s taking everything I’ve got right now to keep typing this and not flip open a new tab and check my email. Having the ability to check email—and a bajillion other things—any time at all, not just when I’m sitting at a computer looking at a web browser… I started to suspect it was not such a great thing for me. Maybe you can handle that temptation. Maybe you’ve got willpower. That’s great for you, but for me, willpower alone didn’t cut it. Checking email, checking Twitter, checking news. Wondering if something interesting was happening anywhere in the world. Wondering if anybody was thinking about me. I felt like my attention span – not so great to start with – was getting worse. My head was kind of buzzing around all the time. And for what? The things I read on the phone tended to make me feel at best unsatisfied (because there’s always more information out there that I haven’t seen) and at worst unproductive and uncool. Okay, maybe that was slightly preachy. My bad. So I decided to try an experiment, just for seven days. I decided to turn off everything that I suspected was giving me this lousy buzzy-brain feeling. But what should I cut? Here’s another thing about me: I don’t lead the most glamorous life. Of the last 100 times I’ve eaten dinner from a restaurant, probably 97 of those were the same takeout burrito from the same burrito place. It’s one block from my apartment. Boring, right? So guess how I feel when I see your fancy food photos on Instagram? Guess how I feel about your SXSW tweets when I’m changing diapers? Okay, I wasn’t literally checking Twitter while changing diapers – I’m not even sure that’s physically possible, or if it is, you’ve got way better diaper technique than I do. Send me some pointers. But you see what I mean. This isn’t a novel idea. Some people don’t feel so great when they read social streams. More articulate people than I have written about this subject. Nuff said. So I pressed the Twitter icon until all the icons started to jiggle, and I uninstalled Twitter and Instagram and Facebook. The iPhone warned me that deleting these apps would also delete all their data. Was I sure? God, was I? Those apps are really cool. I hesitated. But what the heck, I figured. I could always reinstall them in 15 seconds if I changed my mind. It wouldn’t kill me to re-enter my account info. Then, boom. Everything with a stream was gone. The next obvious problem was email. Checking my email reminded me of all these tasks I had to do, but I’ve never been fast enough at typing on a phone to compose a decent reply (as you can see, once I get started, I kind of go on and on). When I checked mail on my phone, I became aware of stuff I had to do, but didn’t act on it. It just sat there, not getting done. Mounting piles of unfinished tasks were not boosting my self-esteem any more than photos of fancy dinners I wouldn’t get to try for 16 years. And the only thing worse than reading an email you can’t do anything about? Not having any new email at all. Because that, quite clearly, means that I am a loser. Disabling email on an iPhone took a little more work. I uninstalled my Gmail app, but the stock Mail app was still sitting there, tempting me, and the iPhone won’t let you uninstall it. 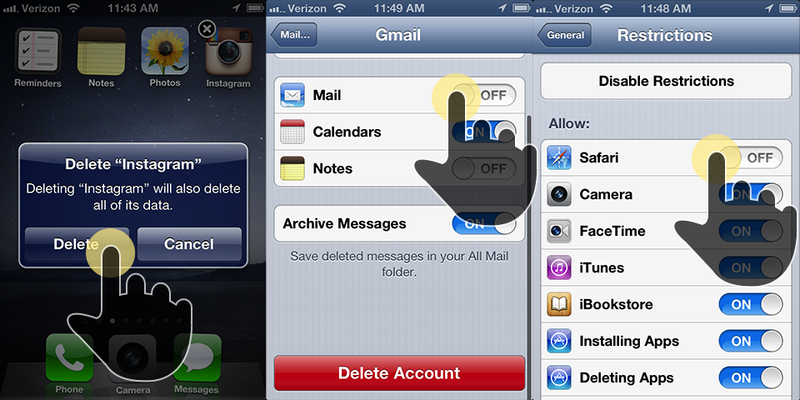 So I went into Settings > Mail, Contacts, Calendars > Gmail > and I deleted the account. It was hard to cut email—my finger was shaking when I pressed that red “delete” button”—but once I did, I was on a roll. Then I realized that the most infinite temptation of all was… the internet itself. I mean, you know how it is. It’s the internet. You have to be a little crafty to disable the internet on your iPhone, but you can do it. I was motivated. I poked around. I poked around some more. Finally I went into Settings > General > Restrictions and I turned restrictions on. I set up a passcode. And then there it was. A bunch of nuclear options to use on people you don’t trust. I am a person I don’t trust. How hard were those seven days? You can probably guess where this is headed: Not as hard as I had expected. I didn’t even notice when I hit day seven, because I was already loving my new incapable iPhone. I still impulsively reached for it when I got momentarily bored—in fact I still do, months later. But without an infinite supply of anything, I just put it back in my pocket. Being bored turned out to be, well, sort of pleasant. Some of the bored moments are actually pretty sweet, like being at the playground with my younger son. If you don’t have kids of your own, the honest truth is that hanging out at the playground can get super boring, and I don’t begrudge anyone checking their phone. But sometimes I’m glad I can’t, because I can just watch him dink around in the sand, or I can stare off into space… it’s kind of nice. And riding on the bus or the train, I don’t have anything to read, so I just get to stare at the other passengers. Fascinating! It’s also the only time I get to listen to music without trying to do something else at the same time, which is pretty enjoyable. But what if I really need _____? Astute readers will note that all of the things I did to disable my phone can be easily undone. You can reinstall apps, you can set your account up again, you can deactivate restrictions. Things come up where I have to use the web, or I have to check an email. Surprisingly, have to situations don’t actually come up all that often, at least not for me. I guess that’s how I was able to survive for so long before smartphones were invented. When something critical does come up, like I need a flight confirmation code or a phone number buried in an email, I re-enable the necessary app and use it. Because the re-enabling takes some effort, I don’t bother doing it if I’m just bored. It’s like BJ Fogg’s hot trigger/cold trigger stuff. I’ve turned those apps into cold triggers, so I have to be super motivated to use them. When I’m done, I disable the app again. Because I enjoy the distraction-free phone so much, it’s always a relief. Okay, I’m writing this on Medium, so you probably figured out I’m a tech nerd. I love all of the stuff I’ve been complaining about. I’m especially one of the last people who should be dissing email. I love email, and in fact, I used to work on Gmail. On my laptop, I read Twitter and email and the news in much the same distraction-provoking manner described above. Maybe I’ll eventually come up with an experiment for that, but I haven’t yet. Some people have asked why I even keep the iPhone. Maybe someday I’ll give it up altogether, but I really don’t think so. There’s so much I love about it. I listen to music on it all the time. The camera is amazing. Google Maps, location-based reminders, the weather forecast, Find Friends to track down my family, Uber… all these things make me feel like I’m living in the future. In a good way. It’s not that I don’t enjoy the iPhone, it’s just that I only want half of it. Full disclosure: I haven’t had much luck convincing people to do this. My friends mostly think it’s just weird. My wife says disabling email is not for her, although she does appreciate that I’m more attentive when watching after our children. I do think it only takes a day to find out if you feel better distraction-free. So if you’re on the fence right now, give it a shot. Disable those apps. After all, you can always undo it. If you’ve done something similar, or if you decide to try your own experiment, I’d be very interested to hear about your experience. Tell me about it.